Glebe Quarry is the only active Ancaster Hard White quarry in the country. When you need Ancaster limestones, come direct to the source for the quickest availability and the best price. Come to the quarry to select your blocks from our stock or we can extract the bed you need directly from the quarry face. Whether you come to the quarry or not, rest assured that you will receive regular-shaped blocks for ease of processing. This will help to keep your costs down and your profits up. We can also supply you with cropped and/or tumbled walling stone and the finest bespoke masonry. 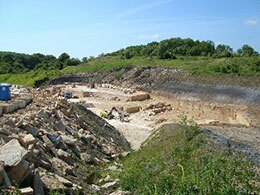 Contact us for prices and samples or to arrange a visit to the quarry.